With Autumn just around the corner and pumpkin ales starting to show up in grocery stores and at my local Coop, I decided to preview the season and experiment with making pumpkin ale cupcakes. 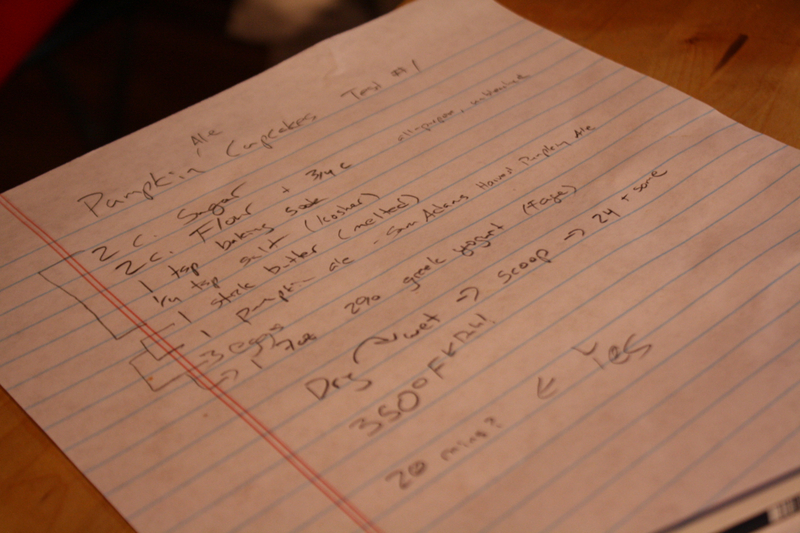 I took notes as I made the cupcakes to keep track of the recipe. For Batch #1, I used Sam Adams Harvest Pumpkin Ale. Although these cupcakes were quite tasty, I have a few tweaks in mind for the next experimental batch. To replicate this recipe (for anyone who can’t wait for a revised Batch #2 recipe), preheat the oven to 350 degrees and mix together the sugar, flour, baking soda, and salt. 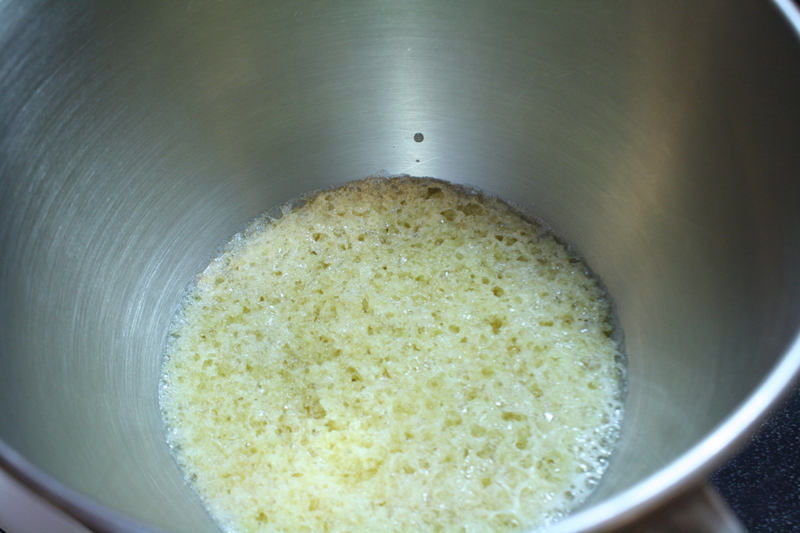 In a separate mixing bowl, add the melted butter and let it cool to room temperature. Pour the pumpkin ale into the butter. Mix in the three eggs, one at a time. After mixing in the eggs, add the Greek yogurt and mix until well blended. 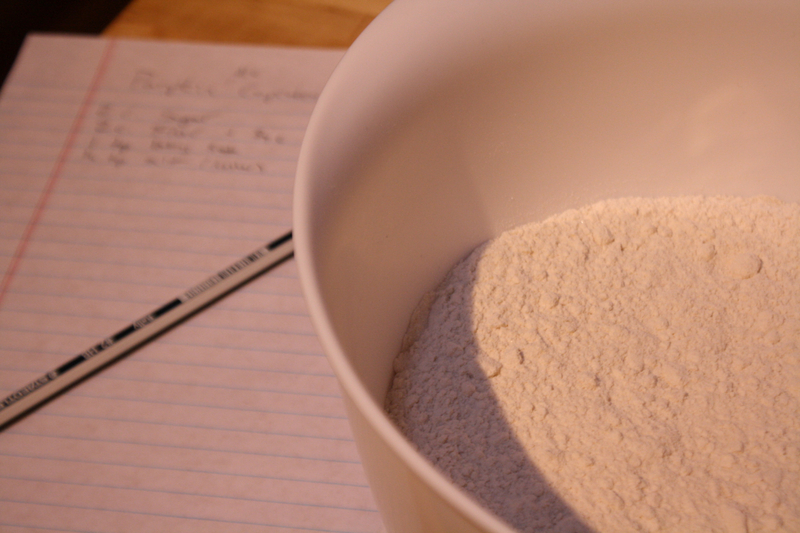 Slowly blend the dry ingredients into the wet ingredients. 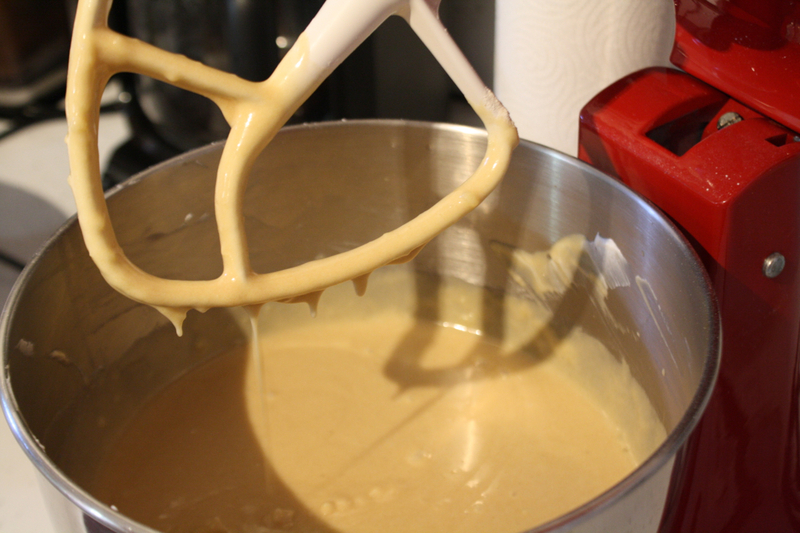 Mix until a smooth, slightly liquid batter forms. 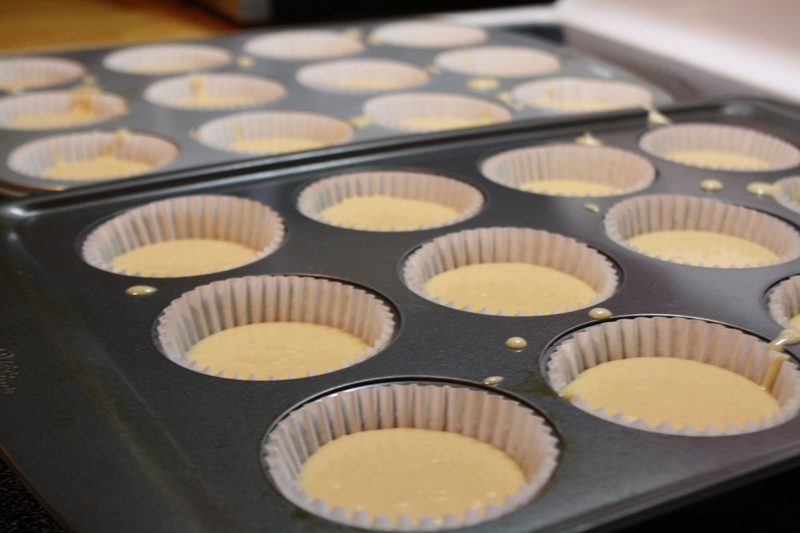 Pour the batter into lined muffin tins, filling each about 3/4 full. I had enough batter to make about 28 cupcakes. Bake the cupcakes at 350 degrees for 20 minutes. 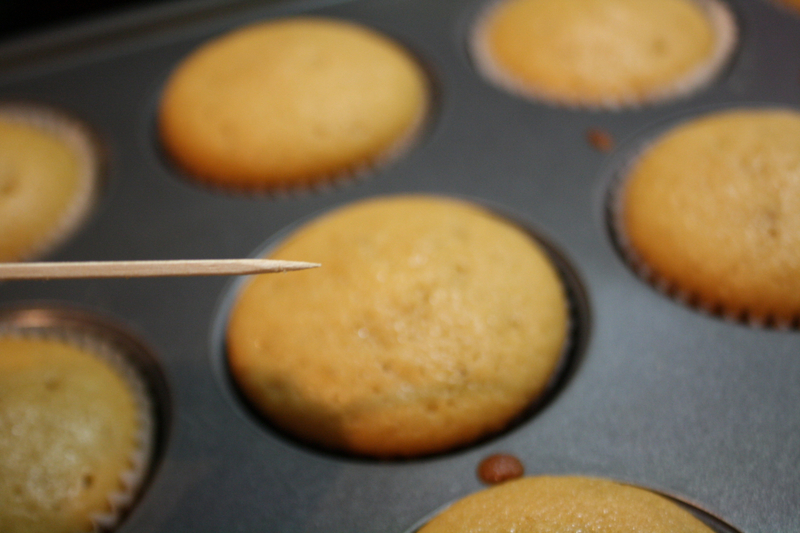 Test the cupcakes by inserting a toothpick into the center of one. If the cupcakes are done, the toothpick will come out clean. Let the cupcakes cool to room temperature before topping them with frosting. For Batch #1, Jill make a frosting by mixing a softened 8 oz block of Neufchâtel cheese (reduced fat cream cheese), 1 stick of butter (softened), and a 1lb box of confectioners sugar. As the frosting mixed, she add a couple of shakes of cake spice (a combination of cinnamon, star anise, nutmeg, allspice, ginger, and cloves). Although I am posting this recipe on the blog, the recipe is not perfect. The cupcakes were good, but there are a few things I will do differently in Batch #2. 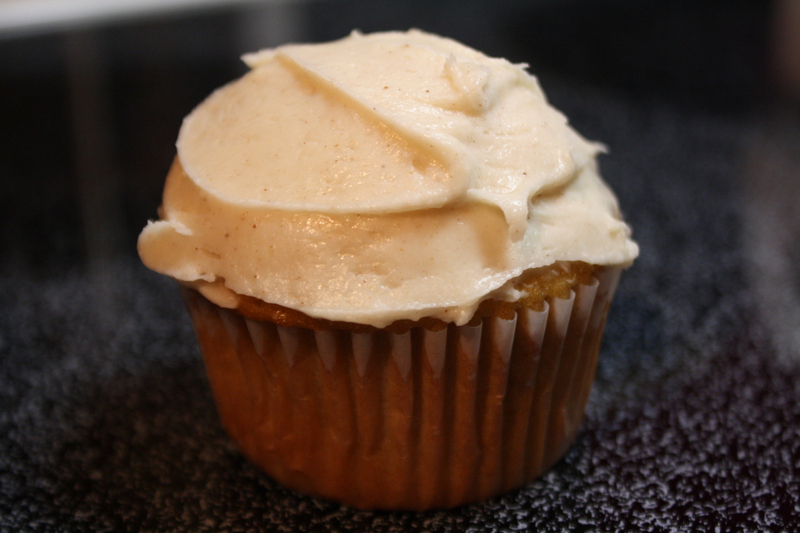 To help elevate the flavor of the cupcake, I will probably add a teaspoon of pumpkin pie spice to the batter. Jill also recommended that I add some canned pumpkin to the mix. For the frosting, I will probably go with a buttercream frosting with some added cinnamon instead of the cream cheese frosting with cake spice. The cake spice was a little too spicy for the cupcake. 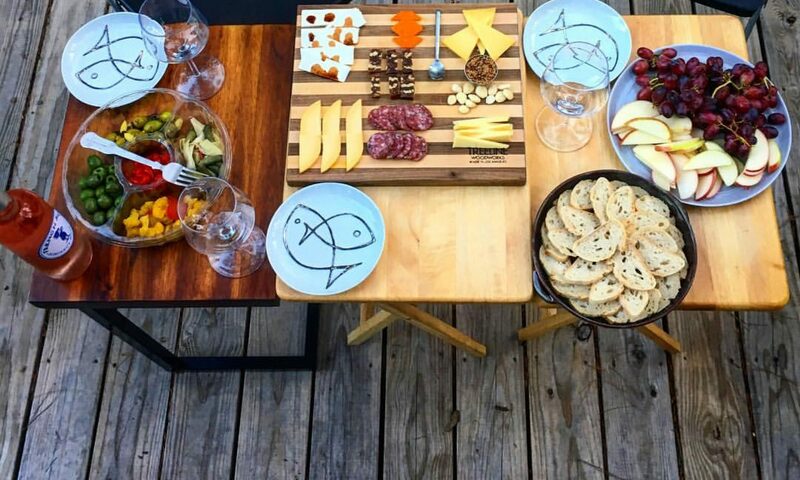 I opted for Neufchâtel cheese instead of cream cheese, hoping that it would not be as rich. Unfortunately, the texture of the frosting was too gluey, probably because Neufchâtel cheese has a higher moisture content than cream cheese. With some of these modifications, I hope to improve this recipe and share it on the blog soon.